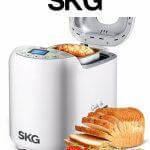 One of the lowest priced bread machines we’ve reviewed with great customer service and minimal complaints from owners. 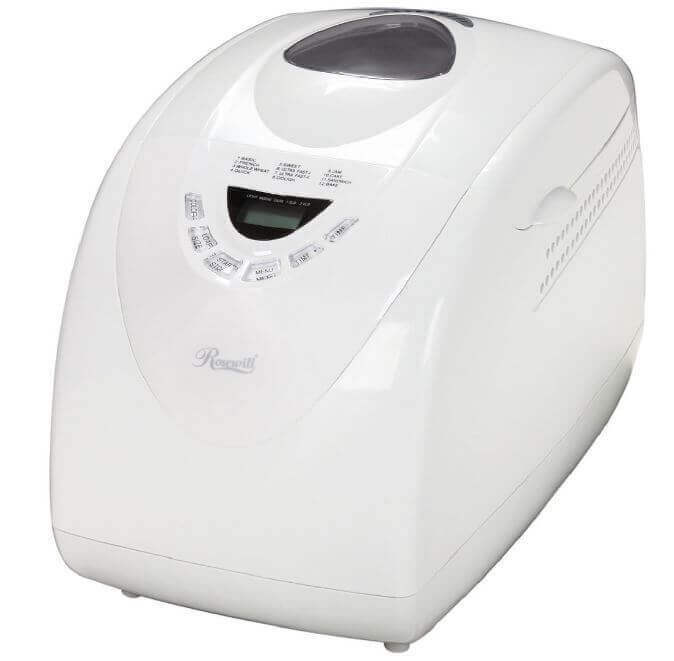 The Rosewill R-BM-01 has 12 pre-programmed settings including: Basic, French, Whole Wheat, Quick, Sweet, Ultra Fast-I, Ultra Fast-II, Dough, Jam, Cake, Sandwich and Bake. It does not have a dedicated gluten free setting, an Artisan setting or a 100% whole wheat setting. The whole wheat recipes call for the addition of some bread flower putting the whole wheat setting at about 30% whole wheat although you can push it if you like. It beeps 4 quick beeps after 30 minutes at 2.30 hours under the regular 3-hour bread recipe. Add nuts then. It also has a 13-hour delay setting, but make sure you don’t add dairy ingredients like eggs, milk or butter if you are using a delayed setting. Find a recipe with non-dairy ingredients that won’t spoil over time. 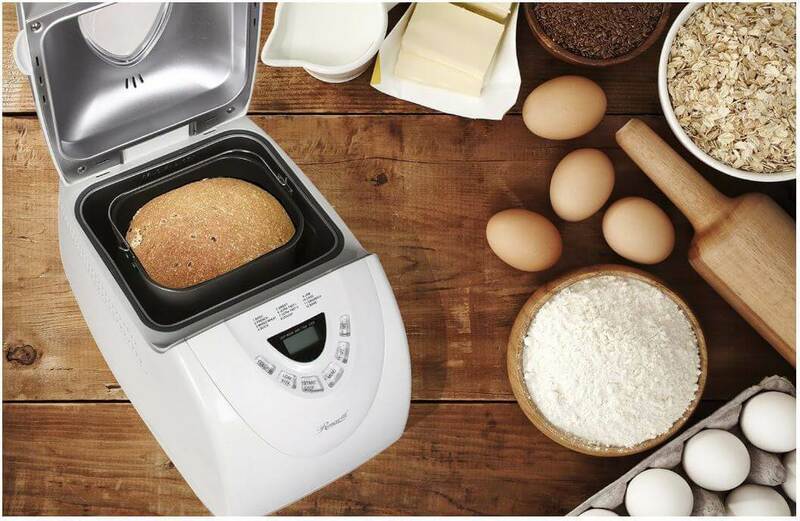 Like most bread machines, the Rosewill has three-crust settings ranging from light to medium to dark. 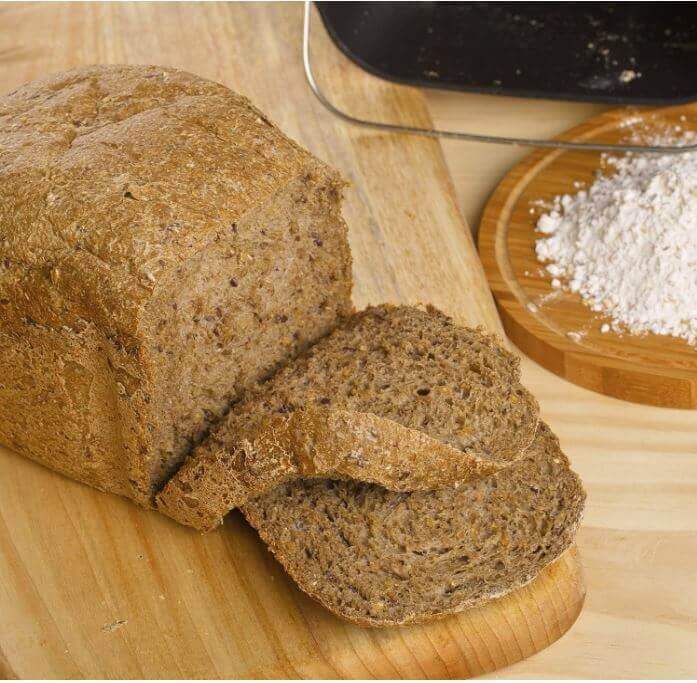 There were minimal complaints about crust color but this is mostly due to people misunderstanding that any bread recipe high in sugar will darken more than other recipes. 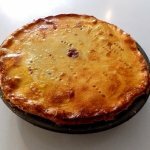 Than again, we all depend on the recommendations in the recipe booklet for proper crust settings. The machine also has a 13-hour delayed-start program and a 60-minute keep-warm setting. Remember that you should never use dairy products or eggs for a delayed start program. Find a recipe that doesn’t require ingredients that can spoil over time. Probably have to call the company about that…their customer service is really good. The machine bakes loaves in 1.5 and 2-pound sizes. This is a bit unusual. Most machines also offer a 1-pound loaf setting but there is no indication that the Rosewill has this option. The non-stick coating is not identified specifically but it is typically Teflon or a Teflon derivative. It’s also curious to note that Rosewill states that the bread pan is dishwasher safe. Most bread machines encourage hand washing with mild detergent and soap in the sink. This is largely due to the fact that the oil in the bearings at the base of the bread pan is compromised when washed in a dishwasher. Rosewill has obviously figured out how to solve this problem. I see so much confusion in the responses. Loaf bakes like in a regular loaf pan. It is about 5 inches wide and high by about 7 and a half inches long. Rosewill identifies two loaf sizes: 1.5 and 2-pound loaves. This is also a bit unusual given that most machines also offer a smaller 1-pound loaf size. You could probably improvise, but I get the impression they do not have a 1-pound setting so you’re on your own if you want a 1-pound loaf. The paddle is nonstick metal. Same material as the pan itself. The machine weighs 14.3 pounds and measures 11 x 15 x 13.8 inches. It’s a fairly heavy machine although there were some complaints about “walking” on certain countertops. The manufacturer touts non-slip feet and they seem to work well on a smooth counter, but if you have a rustic counter made with tiles or an uneven surface you may have some movement across the surface during the kneading cycle. It tends to “walk” a bit when the paddle gets going. So be careful where you use it. It has a digital display and is available in white only. The display is not backlit. Like most bread machines it has a viewing window in the lid but there is no internal light so you’ll need a small flashlight to view your progress. Like most bread machines it is manufactured in China and has a 1-year limited warranty and a 90-day warranty on parts and labor. Great price for a great bread machine. I use mine daily and it always turns out a great bread. 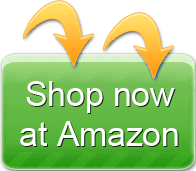 Based on customer comments and reviews the customer service for Rosewill is excellent. They appear to be both highly responsive and offer replacement parts free if there is a defect. That’s unusual for such a low priced machine but they obviously appreciate the value of building a brand and have no doubt built great loyalty with their customers.